Visitors to Old Town Pasadena enjoy views of the first-quarter moon through Jane's 12.5-inch reflector telescope. Being a Sidewalk Astronomer isn't really about “joining” anything — it‘s about embracing a philosophy and acting on it. Ask John Dobson how he became interested in astronomy, and he‘ll answer, “I was born!” People have a natural fascination with the Sun, Moon, planets, and stars, but to most it‘s something they read about in a magazine or see on television. We stop people on sidewalks and let them see the craters of the Moon, the moons of Jupiter, the rings of Saturn, or the spots on the Sun. For just a moment, they have a personal connection with the universe around them, and sometimes life seems a little better after that. Our fall Mojave National Preserve dark star party scheduled for October 6th was cancelled as the date turned out to be unavailable. Our first MNP star party was in 2008, so we hope to resume in the spring or fall, or find an alternative spot. Update 4/9/2019 We are working on some late May/June dates, but it may too hot in the desert for a spring event. Our next in-town events will be on April 13, May 11, Jun 8 weather and schedules permitting. Location is Monrovia, Myrtle and Lime corner just after sunset for about 2-3 hours. Many of our sidewalk events are planned only a few hours in advance. We will send a notice to our events email list on an afternoon when we plan to be observing, or plan to cancel. Join our email list using the link to the left, or look in the event box top of page. 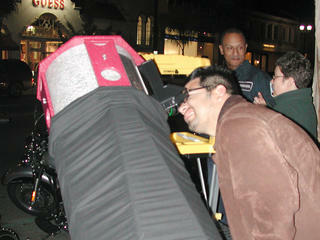 We typically set up telescopes in Monrovia at Myrtle and Lime on Saturday evenings. For us to set up telescopes, the sky needs to be clear, there needs to be something to see (Moon, Jupiter, or Saturn), and at least a couple astronomers need to be available that evening. Weather is always a factor. Our telescopes, big as they are, can not see through clouds. On an evening when we plan to be out observing, we will generally give it a try if there is a better than even chance that we'll get to view the Moon or planets. Occasionally a thin layer of haze will make the sky appear overcast, but the Moon will still show through. There is never any charge to look through our telescopes. December brings the Geminids, a comet and a fond farewell. The Geminid meteor shower peaks Dec. 13-14, with best viewing from dark sky locations after midnight local time. This is Jane's final episode of "What's Up," which she wrote and hosted since 2007. The series has covered the day and nighttime sky, from sunsets to eclipses, planets, comets and beyond, and will continue to do so in 2019 with a new voice. The Sidewalk Astronomers have a grand tradition of setting up telescopes in national parks throughout the year. For many urban dwellers, an excursion to a national park is the only opportunity to see the Milky Way for themselves. A sky full of stars can be staggering to someone who lives under the L.A. light dome. We love to get away from the city lights, and love to invite park visitors to spend a little quality night time under a star-filled sky with our telescopes. Jane and I love to set up our big telescopes in Mojave National Preserve, Joshua Tree NP, Bryce Canyon NP, Grand Canyon NP (north and south rims), and Glacier Point in Yosemite National Park. Mojave National Preserve Spring 2018 Star Party was May 12. The fall public event scheduled for October 6 was cancelled, and we are working 2019 dates and locations. For a taste of what it's like at a dark sky star party, this NPCA video will give you a sample. There are other dark sky star parties open to the public, that your Sidewalk Astronomers often support. 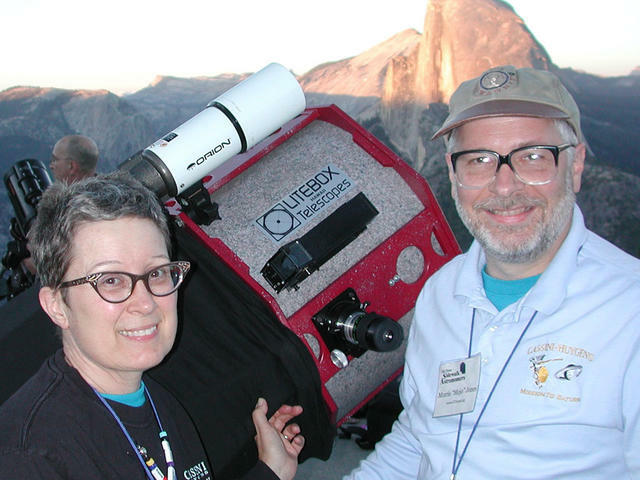 For a taste of what it's like at a dark sky star party, this Yosemite Nature Notes video was filmed during three Glacier Point Star parties Sidewalk Astronomers Jane, Mojo and Gary attended as members of the San Jose Astronomical Association. There are different astronomy clubs presenting free star parties at Glacier Point each weekend from July 4 through Labor Day (full moon weekends excepting), so if you are planning a summer Yosemite trip save a weekend night for Glacier Point - they are listed in the Yosemite event newsletter you receive when entering the park. 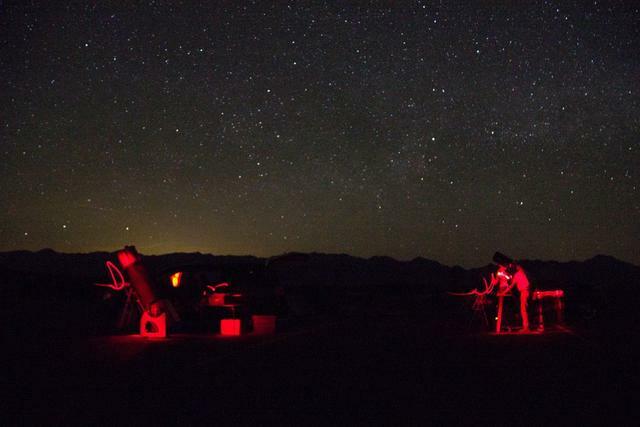 "Mojave Desert star parties unite space lovers together under the stars" story by Caitlin Esch, features great quotes from Jane and Mojo at the Mojave National Preserve dark sky party. Gorgeous video featuring jaw-dropping time-lapse photography of the night sky from Yosemite National Park. Jane and Mojo from the Sidewalk Astronomers are featured prominently. Stephen Coleman joined us to observe the moon on International Observe the Moon Night and captured some great natural-light images of astronomers and accidental astronomers. This three-minute NASA video produced for the International Year of Astronomy 2009 features astronomers from the Old Town Sidewalk Astronomers at our observing site in Monrovia. This is the flier we have at our telescopes for visitors. Jane and Mojo have been setting up telescopes on sidewalks ranging from Hawaii to Florida since 1990. As amateur astronomers, they've participated in meteor observing missions for NASA, and appeared on national TV and radio programs. Jane and Mojo kept the Sidewalk Astronomers active in San Francisco, the birthplace of the worldwide Sidewalk Astronomers, until relocating to Southern California in late 2003. They immediately saw the potential of Myrtle Avenue in Monrovia as the perfect location for sidewalk astronomy, and bought a home there in January 2004. Among their list of awards and accomplishments, minor planet 1992LE was designated 22338 Janemojo in their honor. Jane works for the NASA Jet Propulsion Laboratory in Pasadena managing public outreach and informal education for the Cassini-Huygens Mission to Saturn and Titan. Mojo is a software engineer at Fox Audience Network, and operates his own internet server for friends and family as a hobby. Drop us an email if you would like to have the Old Town Astronomers bring telescopes to your school or civic event. Contact us first to discuss dates that are best for informal astronomy in the city rather than contacting us with a date already selected. Lately we've had to pass on nights with no objects visible on an already chosen night. As a guideline, dates near the first-quarter Moon are the best early-evening astronomy. Don't forget to consider the time for sunset!